A three-disc set featuring The “High Sign” (1920/21), One Week (1920), Convict 13 (1920), The Scarecrow (1920), Neighbors (1921), The Haunted House (1921), Hard Luck(1921), The Goat (1921), The Playhouse (1921), The Boat (1921), The Paleface (1922), Cops (1922), My Wife’s Relations (1922), The Blacksmith (1922), The Frozen North(1922), Day Dreams (1922), The Electric House (1922), The Balloonatic (1923), and The Love Nest (1923). A Kino International release. Directed by Buster Keaton; starring Buster Keaton, Ruth Dwyer, Snitz Edwards, T. Roy Barnes, Frances Raymond, Erwin Connelly, and Jules Cowles. Blu-ray and DVD, B&W/color, 87 min., 1925. A Kino International release. Directed by Buster Keaton; starring Buster Keaton, Sally O’Neil, Walter James, Budd Fine, Francis McDonald, Mary O’Brien, Tom Wilson, Eddie Borden, Snitz Edwards, Howard Truesdale, Kathleen Myers, Ray Thompson, Brown Eyes, Gus Leonard, and Joe Keaton. Blu-ray and DVD, B&W, 153 min., 1925/26. A Kino International release. Kino International continues to provide restored versions of classic films on both DVD and the new Blu-ray format with this new batch of Buster Keaton movies. Having previously released newly restored DVD and Blu-ray editions of The General, Steamboat Bill, Jr., Our Hospitality, and a pairing of The Three Ages and Sherlock Jr., Kino is now offering Buster Keaton: The Short Films Collection, a three-disc set containing all nineteen of Keaton’s solo silent short comedies; his feature Seven Chances restored to better quality than previously available; and a double feature of Go West and Battling Butler. This leaves only The Navigator and College among the Keaton features that have not yet enjoyed the restored Blu-ray treatment. As with the previous Keaton releases, the enhancement of these films make a persuasive case for fans to update their libraries. The Keaton silent shorts had previously only been available scattered among Kino’s earlier DVD releases, with one or two short comedies accompanying the features. This short films collection offers all nineteen two-reelers in chronological order. As with all of Kino’s releases, the best preprint material is used for each restoration, and for some films the disc offers a more “polished” high definition restoration, along with another edition that contains the existing emulsion marks for those who see that as part of the aging film’s integrity. These nineteen short films show Buster Keaton—formerly a featured player in comedian Roscoe Arbuckle’s company—taking advantage of finally having full creative control over his work. Arbuckle had effectively mentored Keaton over several successful two-reelers, and when the rotund funnyman advanced to feature films in 1920, his production company was given to Buster, who was now able to present some of his own ideas on film. These short comedies display Keaton’s mastery of cinema’s techniques at a level never offered by even his best films with Arbuckle, allowing us more fully to appreciate the evolution of Keaton’s often amazing ideas as a comedian and filmmaker on his way to the feature films. Keaton’s first solo short, The High Sign (1920), was initially shelved as Keaton believed it to be a bit too close to the Arbuckle style and less reflective of his own comic perspective (it was released later, but appears first on this chronological set). 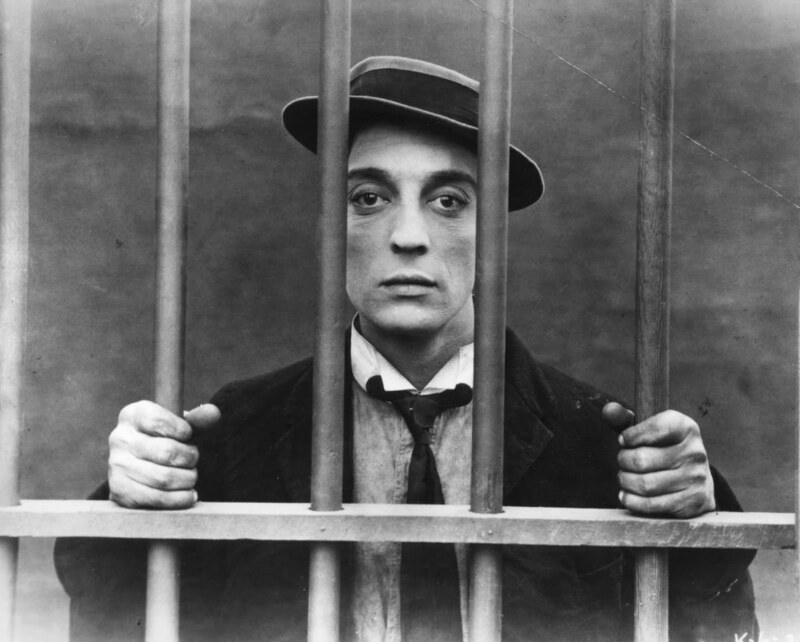 One Week (1920), his second filmed and first released, has remained one of the quintessential Buster Keaton two-reelers. Featuring Buster as a newlywed who must build his own house based on instructions that have been sabotaged by a rival for his new bride’s affections, One Week already fully demonstrates Keaton’s acrobatic mastery, creative use of objects, and his character’s stone-faced approach to any problem. Throughout the three discs on this set, we can witness Keaton’s fertile imagination enhancing the comic possibilities of such standard subjects as haunted houses and marital disharmony, while marveling at the level of creativity that goes into each gag sequence. In Convict 13 (1921), for instance, Buster is golfing and his ball rolls into a lake. He paddles out on a raft, insisting on interpreting the rules of the game literally and hitting the ball from where it has landed. A fish swallows the ball, so Buster dives in, catches a fish barehanded, and inspects it for his ball by looking in its mouth and feeling its stomach. When no evidence is found, he throws it back, dives in, comes up with another fish, and repeats the process until he finds his ball. Buster the character’s approach to this task is highlighted by the same pragmatism as Keaton the filmmaker’s approach to the gag. Cops (1922) is perhaps the grandest of the Keaton shorts, showing the comedian’s brilliant use of narrative structure as one event dovetails into the next until Buster is being pursued by, quite literally, the city’s entire police force. The body of this film becomes an exercise in ingenuity and acrobatic prowess as Buster effectively eludes his pursuers by such methods as running directly toward them and diving between their legs, or creating a seesaw effect as a board teeters over a fence with a cop on either side and Buster in the middle. By this time, Keaton the filmmaker was learning as much about shot composition, precise editing, and camera placement as he was about the effectiveness of presenting his creative ideas. To emphasize the sheer number of police pursuing Buster, Keaton sticks to a series of long and medium shots, moving in for a close-up only on occasion (such as when Buster tries to disguise himself by sticking his necktie under his nose like an ersatz mustache). The music for each short in this set is provided by Ben Model, an accompanist whose talent and vast knowledge of silent comedy’s history gives him the necessary insight to enhance every film. The importance of the nineteen short subjects on this collection cannot be overstated. Each separate film is a classic in its own right. Keaton’s wonderful feature Seven Chances (1925) is best known for its spectacular climax wherein Buster is pursued by several potential brides, clad in gowns, after it is advertised that he must wed by a certain time in order to inherit a large sum. Keaton expands upon the ideas he had presented years earlier in the two-reeler Cops, as Buster evades his pursuers with a series of breathtaking stunts, including tumbling down a steep hill and dodging several large boulders that roll in his direction. The previously available DVD of Seven Chances had been mastered from a standard definition print. For this edition, a nitrate print preserved by the Library of Congress was used. Thus, this version of Seven Chances is of truly breathtaking quality, and an upgrade is necessary for those who own the standard definition version. The same can be said for the disc containing the double feature Go West (1925) and Battling Butler (1926). One of the most interesting aspects of these two films is how they have been generally overlooked due to being made just prior to his masterpiece, The General (1926). To state that all of the Buster Keaton silent features from this period are brilliant on a somewhat equal level may sound like blathering fandom, but, by the time these features were made, the filmmaker had honed his craft and perfected his skills. Go West andBattling Butler are auteurist ventures for Keaton and brimming with creative ideas. Using a Western theme for comedy was hardly anything new by 1925, but Go West expands on ideas that might have been generated by his costarring role in Roscoe Arbuckle’s Western genre satire, Out West (1918), and his own starring short, Paleface (1921). Keaton’s use of the vastness of the open spaces that provide this Western comedy’s setting is just one of the film’s more effective ingredients. It includes many long shots of Keaton surrounded by the immensity of the desert, his diminutive frame enveloped by negative space. Battling Butler uses boxing as its central motif, with Buster cast as an unathletic milquetoast whose embarrassed father insists he prove his manhood with such stereotypical activities as hunting, hiking, and, eventually, pugilism. Buster was a small man, but also a very muscular and athletic one, thus he could cover his body with fancy clothes and play an effete stereotype, while his actual athleticism allowed for the subsequent comic triumph. Amusing ideas, such as taking his pampering valet along on his camping trips, or being served breakfast in bed within the confines of a pitched tent in the wilderness, are subtler than some of the slapstick that can be found later in the film. Extras on these discs run the usual gamut from commentary by experts to publicity stills, all of which can be interesting and enlightening, and there are a few highlights. Seven Chances features two films that have a similar concept: an Edison production directed by Edwin S. Porter and a 1947 Three Stooges comedy, each featuring a central character who must acquire a wife through advertising in order to inherit a large sum. Go West has a fascinating audio extra of Keaton pitching an idea for an episode of TV’s Wagon Train.Battling Butler offers information on a planned sound version Keaton wanted to make in 1947. When Kino released the Keaton collection in the late 1990s, containing all of his independently produced silent features on DVDs, each accompanied by one or two short films, it was welcomed by those of us interested in screen comedy’s history. That Kino has chosen not to rest on its laurels, but to offer enhanced versions of these films, and to keep up with the new Blu-ray format as well, is certainly commendable. Whether or not one has upgraded to Blu-ray, replacing your current Buster Keaton DVDs with these newly restored versions is most passionately recommended. To purchase the Kino Buster Keaton Blu-ray releases, click here.